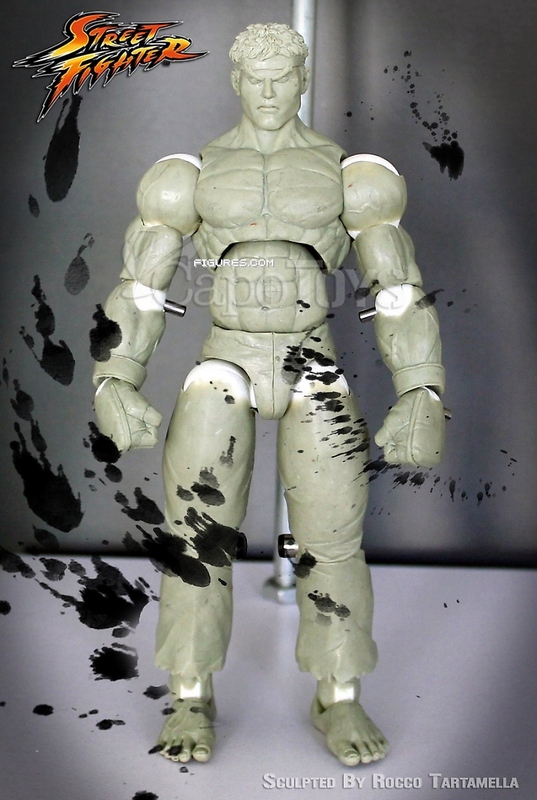 A newer company called CapoToys is going to be releasing a line of fully articulated Street Fighter 7″ Figures. Their aiming for a Fall 2014 launch for the line, with some exclusives before hand. The license is just newly acquired, so official release dates and price points are yet to be determined. The folks over at Figures.com have gotten a look and interview with sculptor, and CapoToys founder, Rocco Tartamella. 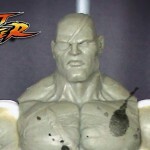 Shown are in-progress sculpts for Ryu, Sagat, Guile, and Chun-Li. Look for a full reveal at Toy Fair 2014 in a few weeks. We’ll have full coverage of the event as well as the CapoToys booth. It's an odd request...but I so desperately hope they make Dee Jay, even if he's slightly out of scale. He's the only character out of the original world warriors (SF2 and it's upgrades) that I am missing from the SOTA toys run. It kills me every I see an empty space on the shelf where he should be. 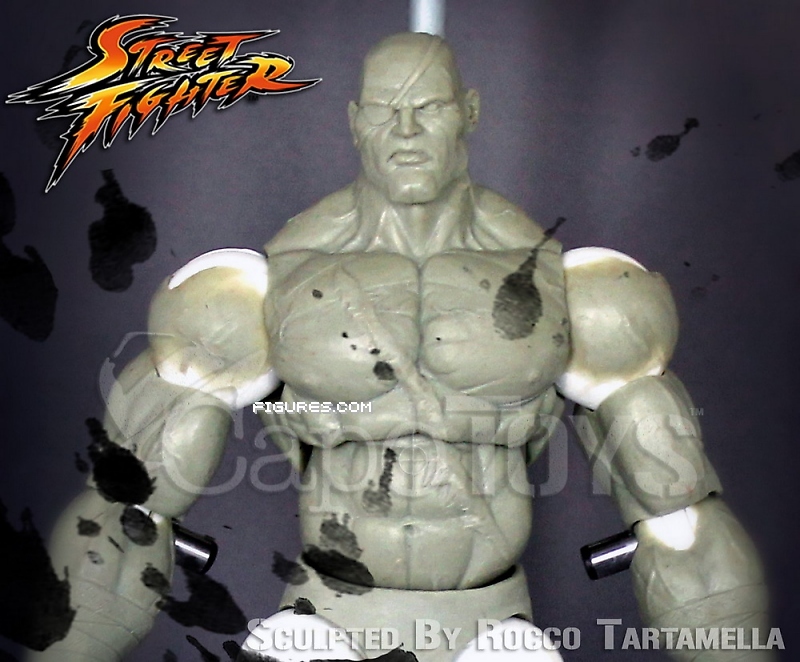 Articulation and sculpts look good, especially on Sagat. Hopefully the paint apps and plastics will be up to SOTA toys standards. While I understand the need for the character since he's the face of the franchise, I'm a little bummed there's yet another Ryu figure coming. I feel like despite his popularity in the game, he's also the reason why the lines never take off, because there is so many iterations of him as is (not to mention Ken, Chun Li, and Akuma, who I have no doubt will be part of the initial offerings should these get out the door.) Either way though, these look good so far, better than NECAs offerings and way better than those lousy 4 inch figs that came out a while back. It truly baffles me that SOME OTHER sites can lay claim that the action figure marketplace (and 1/12th scale, in particular) is dying. Especially when it truly appears that we are in a Renaissance era of 6 inch figures: SW Black, ML Infinite, DCC's offerings,NECA's, Funko Legacy, and now this. A new company out of no where with a MAJOR license. Meanwhile, you have Mattel doing everything they can to cut corners and costs. Strange to me, is all. Mattel is being controlled by the bean counters, the smaller companies are able to thankfully to quality at a decent price without gimmicks like Subs. That said bring on Gouki! I could use a towering Sagat. Well let's hope he's taller than the proposed 7-inch base. They need to make Yuri, Hugo, Poison, and Rolento early on or else they won't make it at all before they end their waves. Many are switching to the 6 - 7 inch scales as those are the most viable sizes and can still be affordable. Toy Fair should put an end to the idea that the market is drying up. If you make good figures of highly sought after characters, you will find your collectors audience. Hopefully this line will sell well enough that CapoToys can succeed in doing what SOTA attempted to do before they closed their doors, and create figures of other Capcom fighting game characters. I'd love to see Darkstalkers show up as a sub-line to these figures, too. But first, bring on the World Warriors! I'll gladly buy a Ken, Guile and that Sagat (if he's big enough).